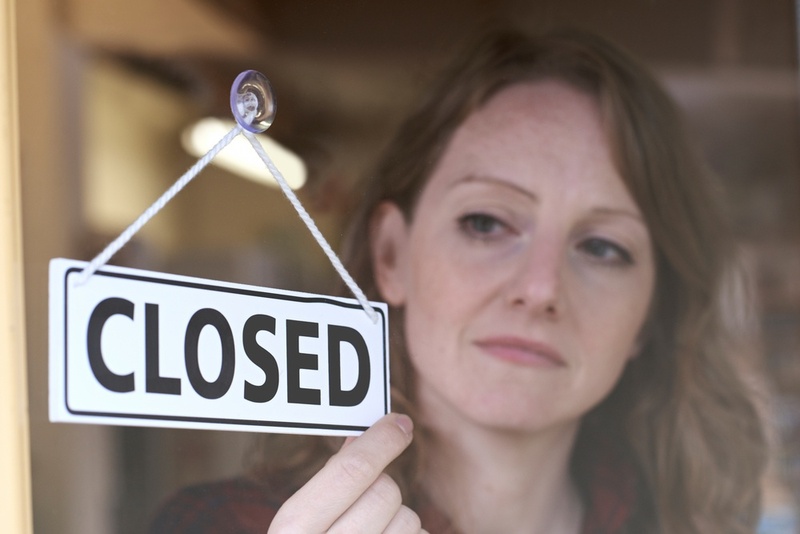 Is it Time to Close Your Small Business? I just saw a longtime friend be forced out of his business. He basically lost everything and had to even move back to his hometown to live with his parents. He told me that he is humiliated. At one time he was very successful but a change in the economy and for what he was doing brought a whole new set of challenges for him. Could he have saved the business? Sure he could have but his ego wouldn’t let him. He considered himself an expert in his field and refused to listen to others. In addition, he failed to pay attention to changing trends, the fact that he was getting older in a youthful business and that he was losing touch as he failed to surround himself with the right people in his business. He went from a hugely successful business to barely keep his head above water to drowning and watching the imminent death of the business he had built from the ground up. He literally broke down in tears. As entrepreneurs, we can only do so much and we don’t have all the answers. We have our strengths and we have our weaknesses but we are not Supermen/women, fortune tellers or money trees. The first sign of a failing business (yes, even in this economy) is a cash flow problem. People will say, isn’t that EVERYONE’S problem? No, it’s actually not and we need to stop comparing our businesses to everyone else and limiting ourselves to what we assume is the norm. Why can’t we have a business that does NOT have a cash flow problem? There are several businesses that don’t worry about paying bills and/or making payroll. There are owners who take extravagant vacations and there are owners who are not begging for business. You would be amazed at how they are often very frugal (that’s another post) but it’s certainly very possible. Sometimes EVEN When the Money is Great You Have to Walk, It’s better to Leave on Top Then to Beg Your Way to the Bottom. While this can’t be all of us it’s certainly achievable (depending on what you do and how valuable customers perceive you and/or your product). The first and most important step is we must always think BIGGER and understand we don’t always just have 1 passion. That’s what makes us “Entrepreneurs” and the very reason that we don’t work for others. We have the ability to create our own destinies. Notice I said “Destinies” as in the plural form. I have to admit, It was very difficult to see a man so broken. He is depressed and he feels like a failure. I can sympathize with him because I have been there too. Many of us look at our business like a relationship. We nurture it and watch it grow and if it dies on us it’s no different than losing a valuable relationship with someone. It goes back to the “train-on-the-tracks-and-paralyzed” theory I was talking about in another post. There are those times when the business has its ups and downs. Of course we want the ups to remain for the longest period of time but unfortunately, outside factors beyond our control can take precedent often preventing that from happening. What do you do when the down periods last TOO long or appear to be lasting longer than usual? You have to evaluate the business, how you feel about it, the economy of the business, trends and where you are as far as your passion to do it. I read the most powerful statement from a departing CEO who left a company that he built called the Black AIDS Institute in Los Angeles. He stated: “A movement that does not prepare, embrace and insist on young leadership is destined to fail. An organization that does not prepare for succession is a hobby. A leader who assumes that he or she is irreplaceable is a fraud.” Another executive in the music industry who went to Wharton told me “The nature of a business is to build it then sell it. In the black community, we keep the business until we die, that’s not a way to get wealthy but a way to inevitably drown.” They are both correct. At some point, the parent has done their job and the child must be freed. An entrepreneur certainly can experience wonderful highs but those lows can also make quite an impression on us. We are MARRIED to what we do as entrepreneurs and if your relationship with your business has soured it’s time to do one of two things: Morph it or Divorce it. Sometimes we are behind the trends and so busy with the day to day that we are missing something. Perhaps our business has lost its appeal to us and it has now become a “job.” One that, like most people who work for someone else, we don’t look forward to doing every day. For an entrepreneur that’s a double whammy because we can change our situation. To run a business that we don’t like doing is a recipe for disaster. I can tell you I have experienced that true passion in my business or rolling out of bed with a huge smile on my face and I’ve also experienced that low of sleeping an extra hour or more to AVOID running my business. It’s the greatest of feelings to do what you love doing, getting paid for it and you own it. The old saying is true: Do what you LOVE and the money will come.” I have never heard anyone say “Do what you HATE and the money will come” (laugh). I read a very interesting story of a man in Black Enterprise who was an attorney, mostly because his parents wanted him to be one. He was successful but he hated doing it. He wanted to, of all things, bake cakes. When he told friends about this some laughed but people who sampled the cakes thought it was a great idea. He left his cushy attorney job, all the money and prestige to do what he was called to do and he has one of the most successful cake businesses on the east coast. Another attorney, I was reading about in the LA Times left his corporate job to use an old beat up Church as a place to create counseling and to show interest in at-risk youth bound for gangs and some who were former gang members. He went from his corporate job to mopping smelly urinals and sweeping up huge dead rats to build and achieve the business for his passion, helping other people. He has since taught those at-risk youth and former gang members to start their own business called Homeboy Industries. His theme is “Jobs not Jails.” He started it in 1992 and not it’s a successful worldwide company and organization. What is your passion…? Do you still leap out of bed ready for the day? Is it the same as it was a few years ago? It might be time to do something else. Do you look forward to running your business? Is it taking its toll on you? Just know that if you started and succeeded at one business, you already have the tools to do it again. Don’t wait until you are completely discouraged because you are so burnt out on what you are doing, save that energy to light the flame under your next venture. Nothing ventured nothing gained. Use your down/free time to make the necessary moves to start your new business and look forward to the day when you can (for the first time or once again) leap out of bed with the greatest smile on your face ready to face a great business day with customers coming to YOU for your services in droves. it IS possible!